Camp Linn Haven, the former “Girls’ Camp,” has been owned and operated by the Lutheran Church as a Christian summer camp since 1942. For many years during the camping season, a worship service led by various Lutheran pastors has been held each Sunday morning. As many Lutheran families moved into the Linville and Avery County area, the desire for year-round worship services grew. 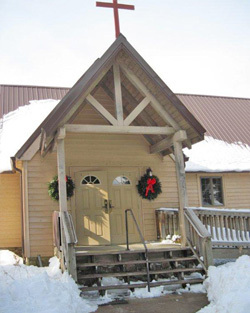 The Camp Linn Haven board of directors, with the support of the Southeastern District of the Lutheran Church-Missouri Synod and several congregations in Catawba County, explored the possibility of establishing a year-round congregation at Camp Linn Haven. In 2003 Rev. Dennis Quackenboss was called as mission developer by the Southeastern District to establish a congregation at Camp Linn Haven. On May 15 (Pentecost Sunday), 2005, Mountainside Lutheran Church was chartered as a congregation of the Southeastern District of the Lutheran Church-Missouri Synod with 50 full-time members. (Worship attendance at Mountainside fluctuates greatly, depending on the season of the year and winter weather conditions!) In November 2018, we installed our current Pastor, Rev. Bryan Chestnutt. Mountainside congregation’s mission is to “give glory to God through our worship and by helping people understand and respond to the gospel.” To that end, we seek and welcome any who are looking for a more certain HOPE, a greater PEACE, a deeper JOY for their lives – the hope and peace and joy God gives through His Son, Jesus Christ.